Hello there, good sir! Or is it madam, perhaps? Well, that’s neither here, nor there! Matters of far greater importance are at hand! It would appear that, through the peculiar optical contraption that you’re staring into, you have managed to find yourself here! Where is here, you ask? Why, in the midst of Tower Wars, of course! I must say, it’s jolly good to have you on board! We need all of the fodder.... ERRR... HELP... yes, yes... all of the help we can get. Steam! Features include achievements, leaderboards, matchmaking, and stat tracking! Need a break? Play one of our offline classic tower defense maps for a quick Time Trial diversion! © 2012 TSC Games, Inc. All rights reserved. 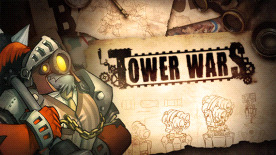 Tower Wars, the Tower Wars logo, SuperVillain Studios and the SuperVillain Studios logo are the trademarks and/or registered trademarks of TSC Games, Inc. and may not be used or reproduced without permission.